This well-researched book provides a fascinating glimpse into the biography of a pioneering author. It also sheds light on the origins of psychedelic America in the 60s and beyond. Symons has definitely done her legwork hunting down cold leads in this adventurous tale, digging up lost manuscripts and chatting with octogenarian artists and scientists to piece together a coherent picture of post-war psychic cosmonauts exploring the mind's boundaries, including extra sensory perception, the origin of hallucinations, age and past life regression, and remote healing. 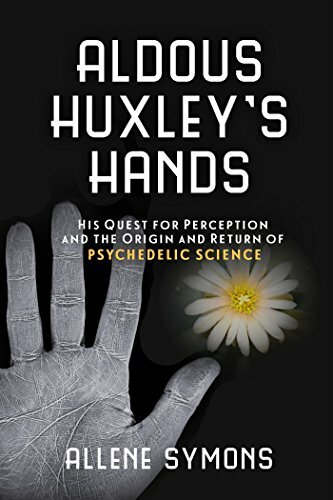 Events got kicked into overdrive in 1950s Los Angeles when Huxley become acquainted with two British scientists, Humphrey Osmond and John Smythies, who had discovered that the chemical makeup of mescaline closely resembled that of adrenalin, a natural regulatory chemical of the human brain; they became obsessed with researching how this powerful drug might form the basis for a biochemical treatment of mental illness, specifically schizophrenia. Adding a couple of drops of mescaline to Huxley's open-minded Los Angeles group made things get interesting in a big hurry. Suddenly the possibility that madness, the origin of artistic genius, and the nature of our individual mind and collective soul could be intertwined led to the seeds of psychedelic blossoming that would convulse the world in the following decade. There was a fascinating near miss when Huxley ventured back to Europe with his wife Maria soon after The Doors of Perception was published, and a planned meeting with Carl Jung fell through when Maria became ill; the Huxleys had to cut their trip short and return stateside. They were both in their intellectual prime; who knows what additional breakthroughs these two geniuses could have sparked at such a meeting. The origin of this book's title is a picture of Aldous Huxley's hands taken by the author's father in the early 50s during this time of intellectual fermentation that the author found digging in the family attic, sending Symons on this journey into the past. While there are some interesting components to this part of the tale, unfortunately Symons attempts to weave this portion of her family history into an otherwise redoubtable biography, the result being, excuse the analogy, like grafting on a third arm. Attempting to be the biographer of a parent is fraught with peril, as the close proximity rarely allows the perspective necessary for a full portrait. Indeed, the character of her father is utterly puzzling, an aviation engineer obsessed with taking photographs of hands, believing that there is some link between their shape and appearance and the biology of the human mind. Although his attempts to accumulate enough photographs for a somewhat scientific study of this nearly phrenological hypothesis make his quest seem less unrealistic, nevertheless this obsession coupled with his side work as a remote healer make him a most opaque individual. There is, possibly, an interesting biography here, but this tale is added in seemingly random dashes throughout the main story. There's not enough depth for this character sketch, and he comes across as wooden and ultimately incomprehensible. If he were vital to the broader tale, this would be more understandable. His ultimately peripheral involvement yields, at times, a somewhat bumpy and contrived narrative. Symons also does not do enough to separate the legitimate and once-again budding research into psychedelics from the other peripheral experimentations of the first half of the 20th century, such as remote healing, ESP, etc. Psychedelics are potentially one of the most powerful medicines available; apparently they allow normally segregated portions of our brains free communication with one another. While in day-to-day life this segregation allows us to make our way through our routine without daylong soul-searching quests about what to eat for breakfast, for example; engaging in this mind-opening activity on occasion in the safety of a prescribed setting can allow insights into our own behavior. The tiny amount of research currently allowed is already showing psychedelics’ potential in breaking addictions such as nicotine and alcohol, treating obsessive-compulsive disorder, and overcoming the devastation of post-traumatic stress disorder, to name a few. Despite these minor faults, Symons has produced a great read in this biography, raising awareness of the potential of psychedelics for a new generation. This is a vital conversation about a potent tool that can help us individually and collectively deal with some of the more intractable troubles currently facing humanity. Kudos to her for her hard work in piecing together this narrative. Stephen Hren is an author whose most recent book is Tales From the Sustainable Underground: A Wild Journey with People Who Care More About the Planet Than the Law. Articles have appeared in Homepower and Backwoods magazines. He is also a professional restoration carpenter and teaches sustainable building classes at Solar Energy International.